Eight years and one day. I was going to say something about how the time had flown but I can actually feel every day today. I am still around even if I don’t blog anymore. Mostly I’m interested in interior decorating. I’m wearing Belleza’s Mimi skin #5 from the Arcade, my Gacha addiction is horrible and the community are all nice, terrible enablers ;-). Luckily, it’s perfect with my appliers because since I broke down and bought Slink hands and feet I’ve amassed quite a collection of manicures to go with them. Today’s pink is from Fishy Strawberry’s Bon Ton set. It’s perfect with this Chevron dress from Cracked Mirror. I’m loving the fitted mesh, being able to use my actual shape makes me happy. The necklace is from A:S:S and the shoes are Ingenue’s Pandora flats, also from the Arcade. I was just going buy a few until I got a duplicate but somehow I wound up with the full set, except the Noir which was ridiculously rare. As for the interior decor, I am particularly happy with what I have right now. 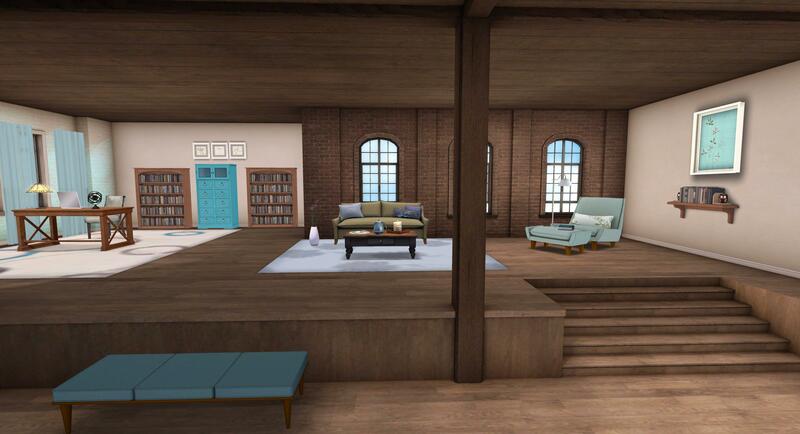 I saw the Nicholaston Skybox from Theosophy on Willis’s blog. I went to check it out and fell in love. 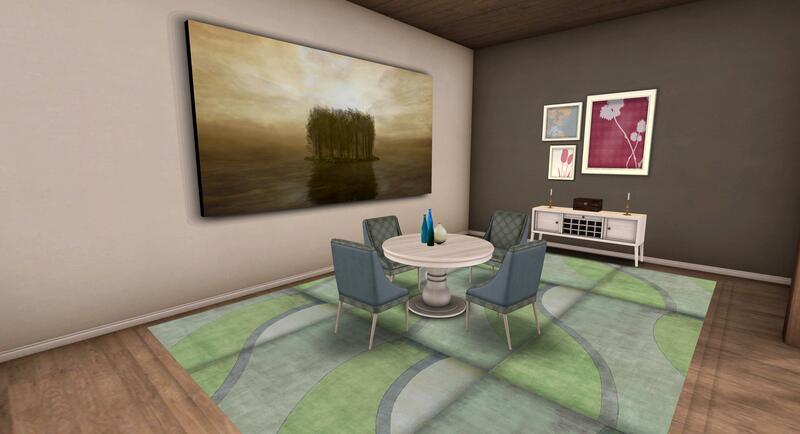 The open, warm interior with that wall of glass was exactly what I was looking for. I managed to fully furnish it with things I already had. It’s like I’ve been collecting for this house for years. I did pick up the decking from Lisp on FLF but I was just as happy without it. That’s what second life is for me right now. I’ve doubled my computer’s memory, installed a new hard-drive, reinstalled the os from scratch and scrapped all second life files to reinstall SL from scratch scratch several times to try different viewers. No matter what, if I’m in world for too long, my entire computer crashes. After it boots back up, most of the time the internet doesn’t work so I have to reboot again. I’m pretty sure it’s overheating the hard-drive because I have to wait for it to cool down before I can login in again for more than a minute before it crashes all over again. This has been going on for a couple of months, which is one of the biggest reasons why I’ve been so scarce lately. The weirdest thing is SL is the only program that does it. I usually miss it but I remembered this year. So this is what I happen to be wearing. Hair from Dark Mouse, skin is LF Chai, top from Whippet & Buck, pants from GLAM. Shoes are my favorite flats by Lassitude & Ennui and my jewelry is by Muse. I unknowingly answered Teagan Blackthorne’s Literature Challenge with the post on Esme, so I thought I’d do another (okay this was already in the works I just thought I’d give her credits for the challenge). This is Alice from the Twilight saga. What do you think? Did I get close? Miss it by a mile? Do you even care? Update: I don’t spend lots of time in Plurk, but apparently without realizing it I answered the Literature Challenge from Teagan Blackthorne. Keep an eye out for Alice coming later. I was attempting to reflect Esme Cullen from the Twilight saga as she wasn’t in the movie much, but in the books I am fascinated by her character. . What do you think? Did I capture her general style? I’m kinda late to blog about the Heart of Love. Laura Limited Edition from AnnaH is what I’m wearing here. The skins created for the drive will continue to be up at 100Limite and the additional L$ are being donated to RFL. Oh and encourage Amelia to drop in from time to time. WOW & school is sucking all her time. My look of the [Random time period] pick from the SL Fashion Notes Flickr Group. See photo for details. You are currently browsing the Uncategorized category at SL Fashion Notes.